A vaccine created from research in space may soon be put tothe test in human trials for the first time. The Astrogenetix company, based in Austin, Texas, has begun applyingfor approval to begin testing their space-designed salmonellavaccine on humans. Salmonellaare disease-causing bacteria responsible for about 40,000 infections in theUnited States each year, according to the Centers for Disease Control andPrevention. Eating contaminated food is one primary means of infection. "If all the stars are aligned, we could potentially be inhuman trials sometime next year," said Astrogenetix CEO John Porter. "That's a real milestone." The company created its vaccinecandidate based on research conducted on NASA's space shuttle flights.Astrogenetix has sent up experiments on 23 shuttle missions so far - mostrecently on Discovery's flight earlier this month. The company plans tocontinue with the six remaining missions on NASA?s current schedule. If their vaccine gets approval to go forward with humantrials, it will be the first time a medicine created from space-based researchhas gone that far. The key to new vaccines lies in an important difference inthe way things grow in space. Many bacteria and viruses have been shown to growmore quickly in the microgravity of space, as well as become morevirulent or more infectious. "We don't fully understand why these bugs showincreased virulence," Porter told SPACE.com. "But when you seeincreased virulence it helps you to target potential therapeutic candidates ata particular disease." The changes that occur in weightlessness help speed upexperiments, and help point researchers toward the causes of virulence, notjust in space but on Earth as well. Astrogenetix scientists have used their experiments to tryto hunt down the genes responsible for virulence in various diseases. Once theyhave identified potential genes responsible, they can try to remove those genesto create a vaccine. "A vaccine is the bacteria itself, but changed in someway so that it doesn?t have the same infectious characteristics, so you canexpose the body to it but not make a person sick," Porter said. "Oncewe can determine the genes that are the root cause of virulence, we can deletethe gene to delete the virulence." That's just what Astrogenetix did for salmonella.Over the course of many experiments, researchers homed in on a pattern of genesthat seemed to be responsible for virulence in the bacteria, and then removedthem to create a test vaccine. Astronauts aboard space shuttle flights helped carry out theresearch. 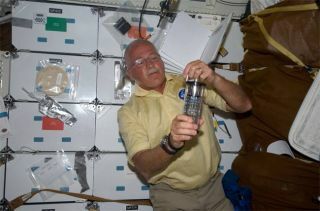 Once in space, an astronaut would activate the experiment, beginningthe growth cycle of the bacteria. Simultaneously, a control experiment wouldrun on the ground. Once the shuttle flights landed, Astrogenetix would collectthe canisters carrying the experiments, and analyze the data. Astrogenetix doesn't intend to stop at salmonella. Itsscientists are also hard at work on a vaccine to prevent infection from Methicillin-resistantStaphylococcus aureus (MRSA) - a bacterium that causes a certaintype of staph infection. This strain is common in hospitals, and is especiallyhard to treat because the bacteria are resistant to a large number ofantibiotics. "It?s a really bad disease," Porter said. "Ourresearch shows that 19,000 people in the U.S. alone die from this a year." The researchers are still in the information-gatheringphase, trying to close in on the genes responsible for its infectious nature. Astrogenetix'slast MSRA experiment flew on the STS-128mission of the shuttle Discovery, which landed Sept. 11. The company hopes to continue this work both on futureshuttle missions, and on long-duration experiments on the International SpaceStation. "We're designing medicines using the microgravityenvironment of space, but these medicines are for use on Earth," Portersaid. "These are true medicines that can be pushed out in the world."